Hey, I wonder what's in there? Maybe I'd better step back a bit...I don't want to scare the sweet darling. Do you mind if I hang out for awhile? When Parental Unit heard me barking my head off and leaping at the back door, she figured it was yet another squirrel that I wanted to banish from our yard...but then she saw this beautiful raccoon stopping by for a morning visit and she thought better of letting me outside! Look at that nosy raccoon peeping in your windows! We would have been barking our heads off too, Bocci! Parental Unit was completely entranced by the masked fellow...or gal. And he or she looked very well fed! Woof! Those hotos are pawsome! 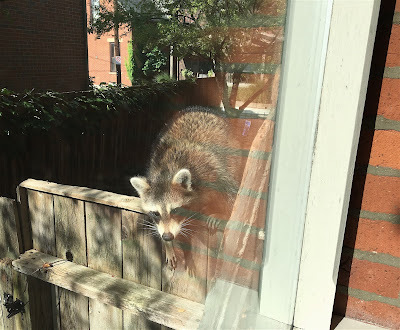 We have the same critters here in our 'hood in Vancouver. That's why Mimi makes our kitty stay in the house after dark. One was sleeping under a tree on our patio once and I was the first to noticed. I barked and barked!! 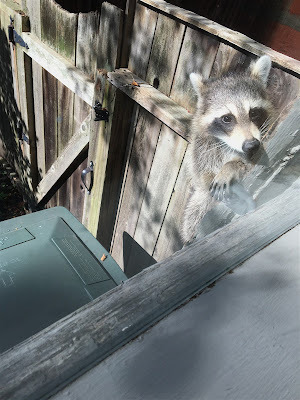 Raccoons are adorable from a distance, but they make me a little nervous up close! 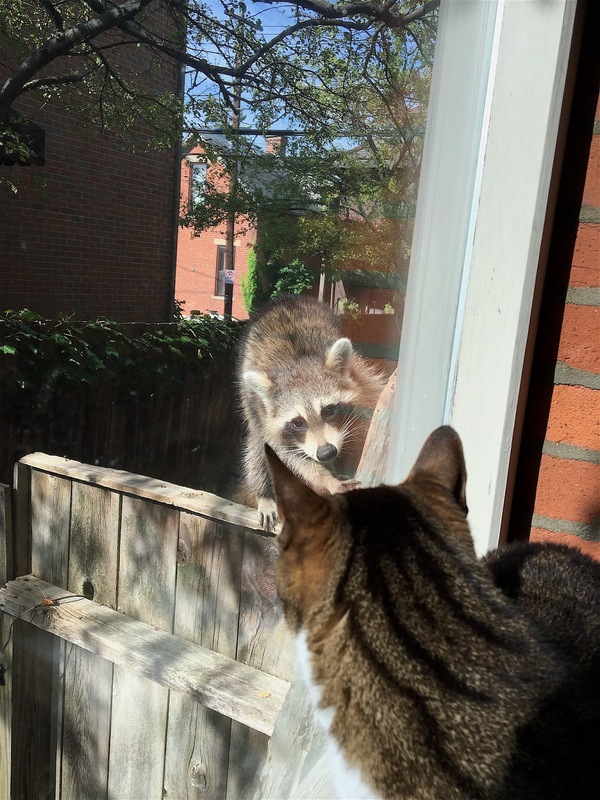 Amazing pictures of this encounter. Thanks about the pictures! 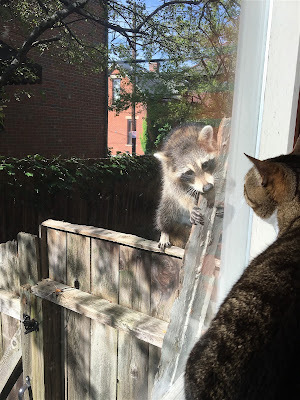 And yes, we love it when neighbors pop over for a (short) visit:-) I have to tell ya that Parental Unit was beside herself with joy at seeing that beautiful, mischievous face close up...thought the old gal was going to invite him in for breakfast!